VoIP Home is a complete fully featured VoIP systems. It allows you to make and receive phone calls from the Internet and traditional telephone network at the same time. It makes managing your communication easier and helps to reduce operating costs and increase productivity. Web control panel is optimized for a screen resolution of minimum 1024 x 786 pixels. 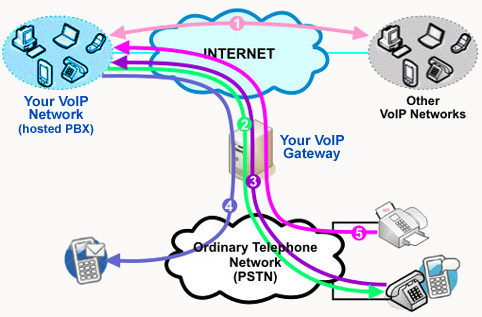 This guide is intended for anyone using VoIP Home system. Only basic computer skills are required. In this manual, you will find a number of styles of text that distinguish between different kinds of information. Here are some examples of these styles, and an explanation of their meaning. Figure 1.1 How VoIP works. (1) make and receive free Internet calls to other VoIP networks. (2) call any land line or mobile (cell) phone at very low rates. (3) receive calls from traditional telephone network. (4) send text messages (SMS) to mobiles (cells) world wide at very low rates. (5) receive faxes to your email address for free. A telephone number assigned to a user (or a Ring Group, IVR etc.) which can be dialled using any telephone in the world. Program running on your computer which allows to make and receive telephone calls (both from the Internet and traditional telephone network). This is a web based application which allows to manage all aspects of your VoIP account. For example you can view your calls history, check voicemail messages or purchase additional telephone numbers.